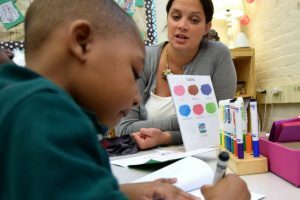 On the ground floor of Russell Elementary School in the Dorchester neighborhood of Boston one February morning, three teachers supervised 20 students in what is considered one of the best free, public preschool programs in the country. Later, there’s story time. First, Bolt offered a preview of the new words the kids would hear, like “ambled,” “curious” and “swishing,” which students acted out by swaying their hands back and forth. Then Bolt read “The Lion and the Little Red Bird”, a story about a curious bird and a lion who loves to paint colorful scenes by using his tail as a brush and natural pigments as paint. 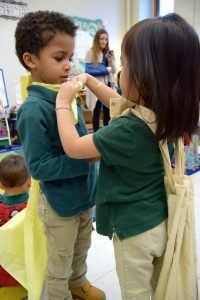 “If it’s not a quality program and it’s just a place for 4 year olds to be all day, it’s not effective,” said Marie Enochty, a program director in the school district’s early childhood education department, neatly summarizing the message heard at every turn here, from the classroom to the mayor’s office. This story — written by The Hechinger Report, a nonprofit, independent news organization focused on inequality and innovation in education — was first published by The Atlantic. It is the second in a series about public preschool that will also examine Head Start, preschool solutions found in other countries, the condition of preschool teachers and the political future of preschool. The first story, about how little the U.S. invests in young children, can be found here.